This is the latest in a series of articles in which we’re looking at ranking players using Series Points, originally introduced in this article, a new ranking method for Test players which directly compares all players together (i.e. batsmen and bowlers as well as fielding ability), whilst also awarding more points to players who performed well against stronger opposition (the original article has a more detailed description of series points for teams and individuals, suffice it to say here that we divide up the team series points [TSPs, which are allocated when calculating the ICC Test Team Rankings] into individual series points [ISPs] based on each player’s performances with bat, ball and in the field). I also covered in the original article the Test Player of the Decade for the 1930s, and subsequent articles covered the 1920s and 1940s. So, going right back to the very beginnings of Test cricket, I would like to present to you the Test Player of the 19th-century. I decided to combine the points for all of the Tests played prior to 1900, as there were fewer Tests being played at that time, and matches largely featured both England and Australia (with a few South Africa matches thrown in) – it was really from the turn of the century that the five-Test series became the norm. We can see that the above list contains names which we would expect to be prominent for the time period, with the two Georges, Lohmann (Eng) and Giffen (Aus), and Hugh Trumble achieving multiple Player of the Series awards – Bobby Peel was only one point away from a second award, finishing one point behind Giffen with 116 points in 1894-95. Billy Barnes achieved the highest total during the period with 127 ISPs in 1884-85, resulting from a performance on the field of 369 runs, 8 catches and 19 wickets, a quality all-round performance by any standard. Lohmann’s 92 ISPs in only three Tests in South Africa is a very high score, founded largely on 35 wickets at an average of only 5.8 (even though accounts of the performance point out that it was achieved on matting wickets, no other English bowler was able to take more than five wickets in the three Tests). The list is dominated at the very top by English players, and this is due partly to England’s additional fixtures against South Africa, where they enjoyed a 7-0 advantage, while Australia did not play South Africa at all during this period. Johnny Briggs takes the top spot ahead of George Giffen, although Briggs played in five more Tests. Still, this illustrates consistent play from Briggs, as he didn’t rank as Player of the Series in any of the twelve series in which he played. The Grand Old Man, WG Grace almost breaks into the top five, despite his best days coming before the advent of Test cricket, and the fact that he was 50 when he played his final Test in 1899. Taking into account this inequality of opportunity as regards number of Test matches played, let’s look at each player’s points per five-Test series (PP5), i.e. the average number of points the player would have scored in a five-Test series, based on his average points per match multiplied by five (as we did in the previous articles). Ranking the players with this method shows that George Lohmann was clearly dominant during the early days of Test cricket, being ahead of the closest challenger, Charlie Turner, by a country mile – indeed the gap between first and second is larger than that between second and eigth position. Lohmann took 112 wickets in his 18 Test matches at an average of 10.75 (the lowest in test history for bowlers with more than 10 wickets), but tragically died at the very young age of 36. Charlie Turner burst onto the Australian Test match scene in the 1886-87 tour by Arthur Shrewsbury’s England side, taking six wickets for only 15 runs in his first match as England were skittled out for 45 runs. Bobby Peel was named as one of the very first Wisden Cricketers of the Year in 1889 (which admittedly featured only bowlers) but was a good enough batsman to hit three hundreds in May of 1896. 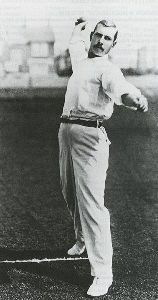 Tom Richardson is widely considered to have been one of the finest fast bowlers of all time, although he played in only 14 Tests. He and Lohmann together bowled out the Australians for only 53 at Lord’s in 1896. Bobby Abel, during his very successful tour of South Africa in 1888-89, had both an average and aggregate of more than twice that of any other player in the side. George Giffen might have ranked even higher, had he not declined invitations to join the 1888 and 1890 Australian teams. His two Player of the Series rankings were interestingly both achieved while playing for the losing side. Allan Steel was considered the best all-rounder of his time after WG Grace, and his performance in Sydney in February 1883 (156 runs for once out and six wickets for 83 runs) is a good example. Billy Barnes’s all-round ability was touched on earlier, and he finished his Test career with a batting average of 23.38 and 51 wickets at 15.54. Willie Bates, Player of the Series in 1882-83 (during which he achieved the first hat-trick by an Englishman in Tests), was injured by a ball in the face during net practice in the 1887-88 tour and sadly never played first-class cricket again. Rounding out the top ten is Hugh Trumble, the Australian off-spinner, who enjoyed fine series’ at the end of the century and also into the next one. As mentioned at the close of the previous articles, it was necessary to have a qualifying number of games, however at least one of the non-qualifiers deserves a special mention. Monty Noble played in only nine Tests at the end of the century, however his PP5 total of 103.9 would have given him second place ahead of Turner. Also, Tom Kendall played in the first two Tests in Australia scoring 62 points and being Player of the Series while garnering high praise from James Southerton, yet never represented Australia again. The next article will concentrate on cricket’s “Golden Age”, the pre-war years of 1900-1914.